Jazz composition has established a long and fruitful relationship with visual art. Duke Ellington’s “Diminuendo and Crescendo in Blue,” Charles Mingus’ “Self-Portrait in Three Colors” and Miles Davis’ “Sketches of Spain” all ostensibly drew from the principles of movement, balance and hue for a kind of jazz synesthesia, just as Romare Bearden’s jazz-inspired collages visualized syncopation, repetition and motivic improvisation. 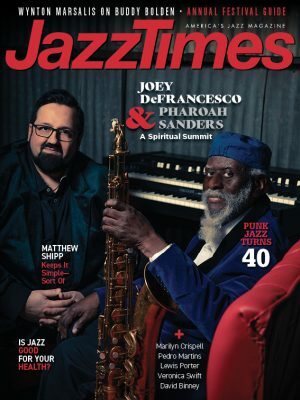 Jazz criticism’s descriptive palette has liberally used visual metaphors to the point of cliché. But what about jazz programming? 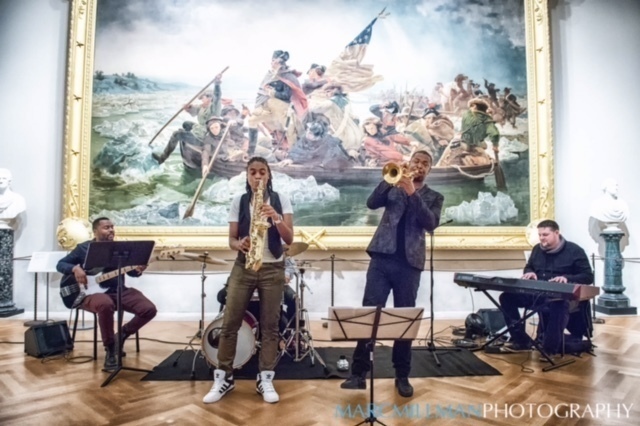 On Friday, January 30, “Jazz and Colors,” now in its third year, made that interdisciplinary connection in broad strokes, with 15 ensembles performing the same set list in 15 galleries spread across New York City’s Metropolitan Museum of Art. The event, a co-production of impresario Peter Shapiro and Met Museum Presents, was programmed by Brice Rosenbloom, music director at Le Poisson Rouge and a producer of Winter Jazzfest, and Limor Tomer, general manager of concerts and lectures at the Met. Like a jazz-themed variation on the Night at the Museum franchise, from 6 to 9 p.m., the museum was awash in blues, but more than kitschy cross-pollination, the effect of a jazz score at the Met elevated each composition to the vaunted status of high art, perhaps more than it injected European sculpture with a burst of long-lost sangfroid. Yet the mixed-media comparison, though generally anachronistic, yielded insights about the points of intersection; jazz improvisation and visual art share an ephemerality and an interpretive framework, though with the former, much remains unrecorded, lost to the relative impermanence of the medium. Sometimes, you just had to be there. This installment of the event, dubbed “The Masterworks Edition,” was the first to take place indoors. The first two editions of “Jazz and Colors,” scheduled for the fall, were held in Central Park to highlight the foliage, a more organized version of the jazz busking that accompanies any given Sunday in the park during the fair-weather months. 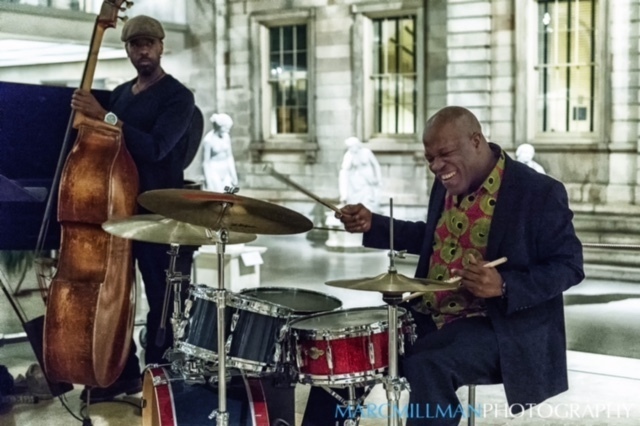 At the Met, the focus was shifted from naturalism, the pastoral mode of jazz, to the act of representation itself. 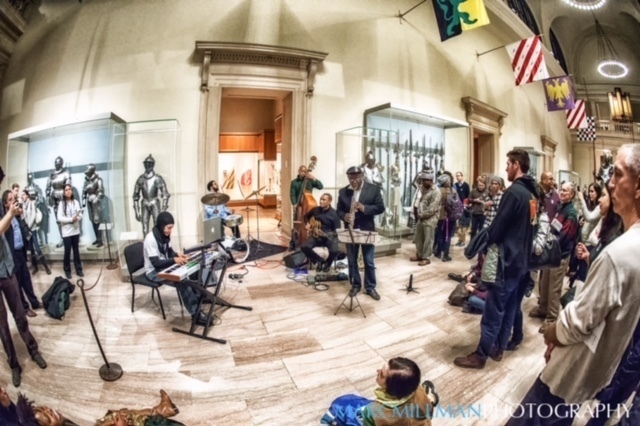 The gallery setting emphasized the unique mix of intellect and emotion that colored each performer’s interpretation; not just the striking polyphony engendered by the same standard repertoire, but by setting strict parameters, the artists were free to embellish on the subtlety and nuance of their individual voices. Just as the advent of photography counterintuitively liberated the artist from the burden of photorealism, the focus here was not on a technician’s imitation of a bygone era. Like Cezanne and fruit, it was not the blues, but the way they played it. Navigating the labyrinthine space was aided by following the uncanny echo of familiar chords in a far-off room. The still-life master served as a backdrop to the Amir ElSaffar Quintet, which inflected Sonny Rollins’ “St. Thomas” with impressionistic, clustered harmonies and an upwardly modulating variation on the chord progression that ascended as the rhythm section seemed to accelerate into a cacophonous frenzy. In contrast, framed by two Keatsian urns, Jenny Scheinman’s languorous take on the calypso standard inflected the piece with a melodic minor motif, understated thematic riffs by Doug Wieselman on bass clarinet, with guitarist Marc Ribot showcasing his consummate fingerpicking technique. Cellar and Point’s J.M.W. Turner-esque rendering of “Stompin’ at the Savoy” was nearly distorted beyond recognition, lyrically blurring the changes with bowed vibraphone, arco bass and eerily dissonant guitar fuzz, with drummer Joe Branciforte’s light cymbal work deadening the propulsive stomp of Chick Webb’s original. 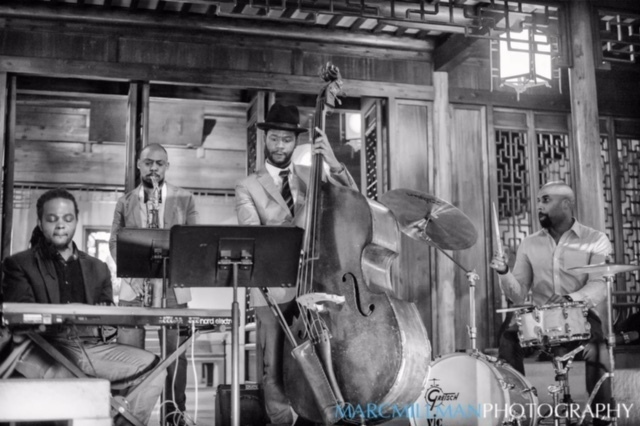 Linda Oh’s “Stompin'” ghosted the reed melody line, with tenor saxophonist Dayna Stephens covering the horn part with a diaphanous tone that imbued it with a modal feel opposite drummer Justin Brown’s behind-the-beat feathering. 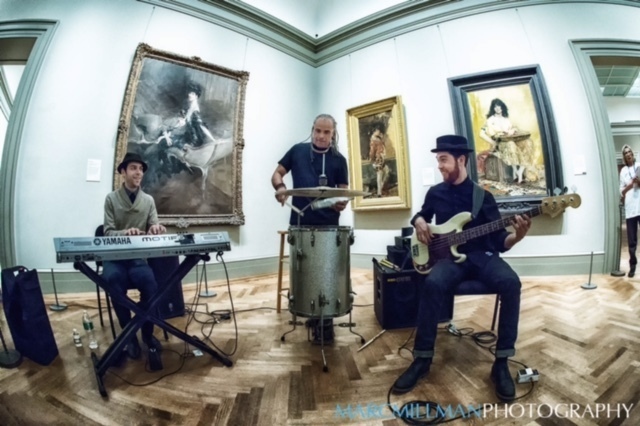 Flanked by the portraiture of the Paris Salon, seated at a skeletal drum kit, percussionist Mino Cinelu and his World Jazz Trio maintained the fiery restraint and unrelenting harmonic tension of Ornette Coleman’s “Lonely Woman.” From a nearby room in Contemporary Art, pianist Matt Mitchell and percussionist Ches Smith’s high-decibel duo was all release, pairing pounding mallets with a synthesized exploration of Coleman, evoking Cecil Taylor’s “eighty-eight tuned drums.” The abstract expressionist Hans Hoffman complemented the Diver Trio with drummer Allison Miller, guitarist Steve Cardenas and bassist Ben Allison. Confronted by Hoffman’s geometric shapes, it was hard not to think of the group’s take on Alice Coltrane’s “Blue Nile” as angular, its polyrhythmic minor groove vibrating with an intensity beneath the bisecting contrapuntal lines. 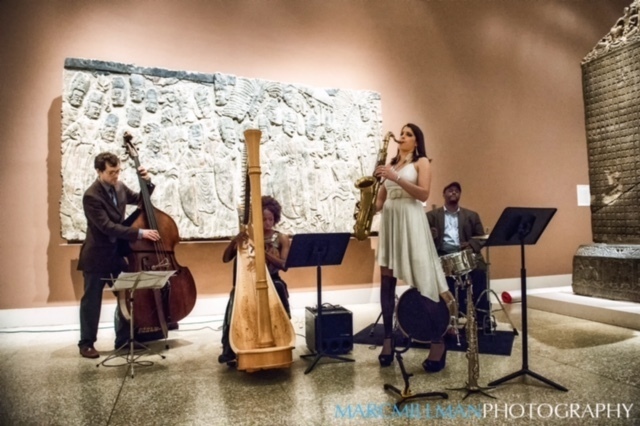 It might have been ideal to catch harpist Brandee Younger’s cover of the Coltrane harp standard, but navigational difficulties left this writer to the whims of the museum and its multifarious gallery spaces; getting lost at the Met was one of the event’s frustrations that led to unexpected discoveries. Amid the Asian Art Gallery, Younger’s interpretation of “Freedom Day,” from We Insist! Max Roach’s Freedom Now Suite, with multireedist Chelsea Baratz on the front line, showed just how far the piece has risen in esteem since its controversial 1960 release. Immediately leading into Black History Month, the 15 simultaneous performances of the pre-civil rights anthem were a testament to the strength of jazz relativism and freedom of expression, artists united in the same cause to champion the artistic difference that can only be heard but not seen.